Can Meal Kits Ever Catch On? The idea of getting the exact number and quantity of ingredients needed to cook a clearly written recipe, in one box that’s delivered right to your doorstep, is a self-contained (literally) and innovative convenience, one that continues to result in IPOs and the attention of folks who have millions of dollars to throw around. In theory, it makes it easier to shop and cook. Yet locking customers into set meal kits accompanied by a surfeit of packaging has instead created an industry that, so far, has mostly caused customers to shrug. What’s going on? Take, for example, the biggest player in this space: Blue Apron. Last month, Blue Apron introduced its splashy Chrissy Teigen kits, with offerings like a campy “Chinese” chicken salad with wonton noodles. The move was meant to bank on the idea of celebrity sponsorship and associated goodwill, but any excitement from the partnership was nevertheless dulled by the news that Blue Apron has recently shed a quarter million users and faced lawsuits from disgruntled investors. It’s not clear what meal-kit companies are trying to do anymore. 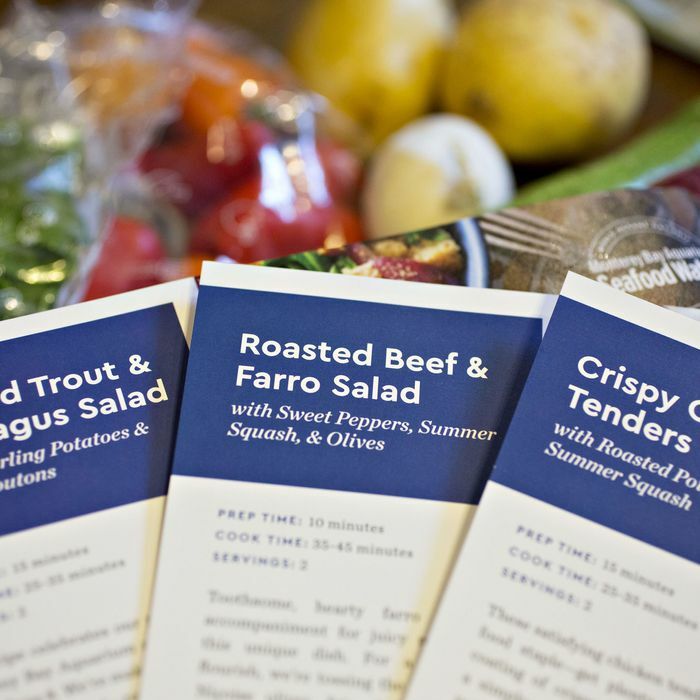 HelloFresh is Blue Apron’s chief rival. Over the weekend, the company announced that it would start selling its meal kits in about 600 Stop & Shop and Giant Food supermarkets, with plans for an even broader rollout. Earlier this year, Blue Apron announced its own similar alliance with Costco, and smaller meal-kit companies like Home Chef are partnering with chains like Kroger. Aren’t supermarkets the very thing that meal-kit companies were invented to disrupt? The move is like Casper deciding to open pop-ups inside of brick-and-mortar mattress stores: It might free customers from onerous subscription models, but it also creates confusion about what, exactly, these meal kits are supposed to really be. Celebrity involvement isn’t the answer. Getting extremely famous people to “curate” recipes and share some of their personal brand through food boosts the utilitarian appeal of kits. Martha Stewart hawks vegetarian pad Thai with “artisanal ingredients,” and Oprah signed with Weight Watchers on a line of meals. The problem is that celebrity endorsements don’t get people excited to cook: Generally speaking, there’s an enduring understanding that these spokespeople are getting paid a lot to put their names on products, and that takes precedence over the actual food. Whole Foods cannot be ignored. With billions of dollars at stake, Blue Apron’s shaky IPO and its aftermath was a clarion call that maybe some activities — shopping and eating — just aren’t ready to be disrupted. One thing that’s certain is that the timing could not have come at a worse time, as the entire grocery industry now must steel itself against whatever ruthless discounts or rewards programs the powerfully synergized Amazon and Whole Foods might unveil. Now is not the time for more packaging. At a time when just about every civic-minded individual seems set on ending plastic straws, increased scrutiny falls to the question of food packaging and environmental concerns. Whales are ingesting the former; hapless sea turtles are stymied by the latter. Plastic-free and zero-packaging food stores have gained momentum in Europe. They should be bigger here, but the perception continues among consumers that buying into meal-kit culture also means buying into more packaging and waste, not less. Meal kits’ rollout to supermarkets may mean fewer three-pound ice packs or reams of space-agey bubble wrap, fewer nesting cardboard boxes, and relief from some of the Sisyphean recycling tasks home users face. The optics aren’t great when there are still lots of tiny jars of condiments, pouches containing a few ounces of quinoa, clamshells for four sprigs of mint, and what look like dime bags of smoked paprika. Even recyclable, biodegradable, or compostable materials — which most meal-kit services have shifted toward or adopted — represent an additional manufacturing burden, environmental footprint, and ultimately, more trash to take out. It’s the last thing anyone wants to think about when all they want is dinner.